It was a bright and sunny day in Hong Kong. After a good breakfast of pastries and good coffee, we were fully energized. Before arriving here, we wondered what are the Things To Do in Hong Kong? 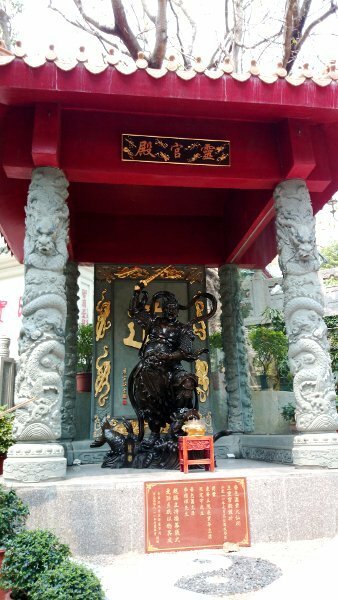 After a bit of research, we found out that there is a famous attraction called Sik Sik Yuen Wong Tai Sin Temple. It took switching train lines and some stops to reach there. About half an hour from our hotel, walking included. We were really excited. It was said that Wong Tai Sin grants every wish. We intend to each make a wish. Join us for this little trip to this awesome place. 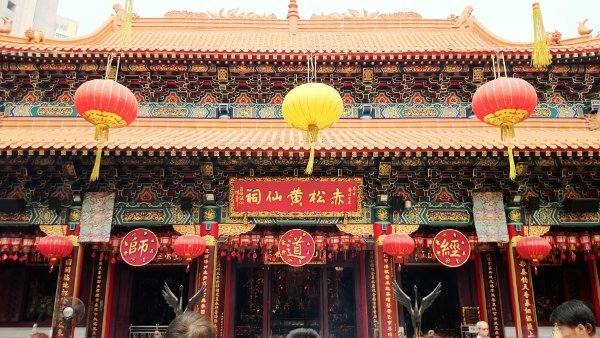 The temple is named after a famous monk called Wong Tai Sin. His full name is Huang Chu-ping. He was born in the 4th century. After years of practice, he became a deity at Red Pine Hill, known as Heng Shan in Chinese. There was a sacred portrait of him that was transported from Guangdong to Hong Kong. Eventually, the portrait was relocated to where the temple is today. Now, devotees arrive from all over the world to pay respects to Wong Tai Sin. At the same time, they submit offerings and pray for good fortune. They also receive divine guidance using Kau Cheem (explained further down this blog post). Book Your Rooms with Agoda and Get Up to 70% Off! Click Here! We arrived early in the morning, and the place was already filled with lots of people. There were many who came in tour groups. When in such a large crowd, it was not easy to take a photo of the sights without a stranger posing in them. Travel Tip: Arrive earlier when tour groups have not arrived yet. Or later when they have all gone. It was also not easy to take photos of only me or with my friends plus the scenery there. There was always people posing here and there. Travel Tip: Quickly jump in at to take photos of you against the scenery when you see people vacate the spot. Or when you wish to take a photo of any scenery. Don’t wait. It took me a while. I waited for some time. Tourists from the tour groups kept appearing to pose with the above Guardian Deity. Finally, when there was a brief moment free from people invading the space, I quickly snapped a photo of the Guardian Deity. Impressive figure, isn’t he? After climbing up the steps, we arrived at the Sik Sik Yuen Wong Tai Sin Temple itself. It is so beautiful and ornate. I loved the intricate paintings on the walls. They were like golden lined clouds. Perhaps a symbolism of a heavenly place? Look at the rooftop. It is so well designed. The large lanterns with gold trimmings gently swayed. They created a sense of grandeur. Plus the pillars and boards with gold Chinese words, all add to a very fine structure. When you step back a little, you could see devotees praying and placing incense into long rectangular incense holders. Here is where you can pay your respects and make a wish. 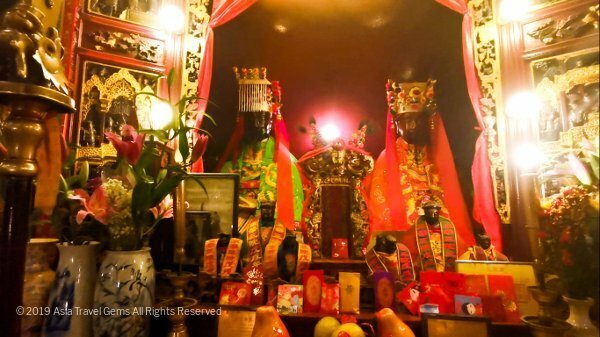 It is said that all you have to do is hold the incense in your hands, lift it up to the front of your face or slightly above your head, face Wong Tai Sin, and then make your wish. Some devotees, while there, would seek guidance on their fortune. They did it using Fortune Sticks in a method called ‘Kau Cheem’. Divine Guidance at Sik Sik Yuen Wong Tai Sin Temple is done by first doing Kau Cheem. Kau Cheem is available at every temple with Fortune Sticks and Moon Blocks, as shown below. 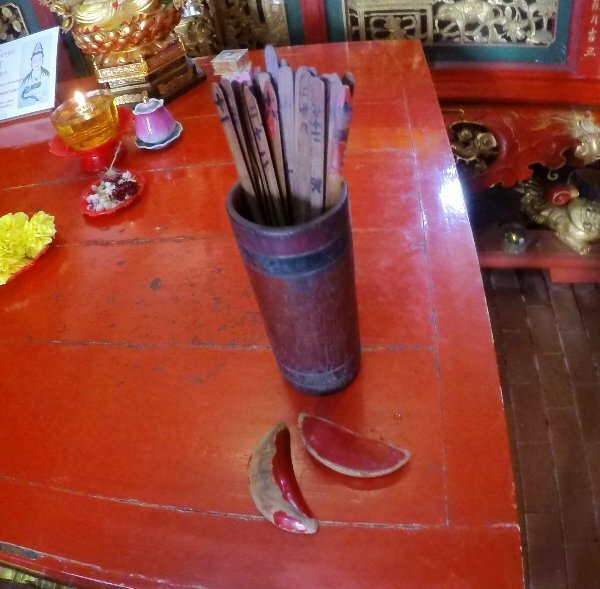 But at Sik Sik Yuen Wong Tai Sin Temple, they only provide the container of Fortune Sticks. Find a counter that offers this container, and get one. How to Do Kau Cheem? 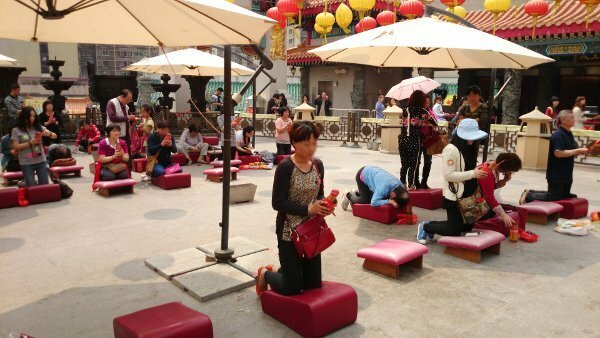 After you collected the Fortune Sticks, go to the area where you see many people kneeling on red cushions and shaking the container of Fortune Sticks, as shown in image below. Choose one of the red cushions and kneel on it. 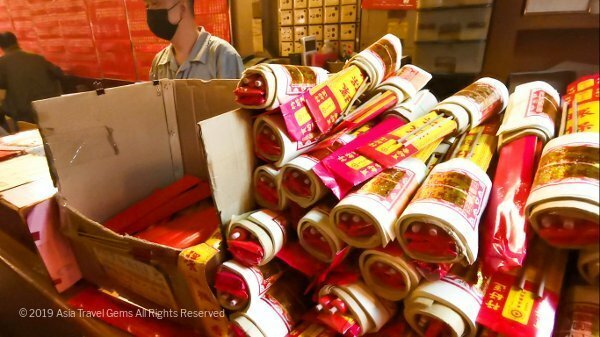 Then, while facing Wong Tai Sin, hold the container of Fortune Sticks with both hands and shake it. While shaking the container, ask your question or say your wish. You can do it silently, in a whisper or out loud. Hold the thought of your question or wish as you shake the container. Remember to tilt the container slightly forward with the mouth of the container slightly facing Wong Tai Sin. This is to allow the chance for one of the sticks to fall out. But you don’t want to tilt too much or shake too much. This may cause many sticks to fall out. You only need one. How to Know If The Fortune Stick Is the One For You? At some point of time, one of the sticks would fall out. At other temples, there is the use of Moon Blocks to help decide if this is the Fortune Stick for you. But here, as mentioned earlier, there are not Moon Blocks given. Not to be concerned. Just know that the stick that fell out is the correct one for you. It is the one that answers your question or wish. If more than one stick fell out, then replace them into the container and try again. Note that there should only be one. When you finally get the Fortune Stick that answers your question or wish, take note of the number of that Fortune Stick. Yes, there is a unique number for every stick. Replace it into the container and return the Fortune Sticks and container to the counter. How to Interpret Your Fortune Stick? Like everyone, we did Kau Cheem when we were there. And like everyone, we wondered what the Fortune Stick said, what message did Wong Tai Sin have for us? At other temples, they would give interpretation slips for each of the Fortune Sticks. And they would give it for Free. 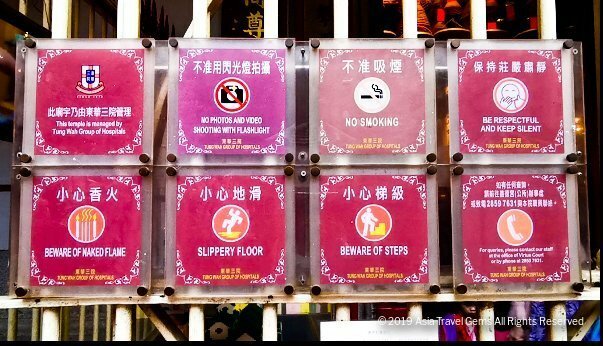 But at Wong Tai Sin Temple, this was not done. There was an area where there were rows of fortune tellers who offered to interpret the Fortune Stick at a fee. We were not keen to do that for many reasons. Firstly, the fortune tellers were always trying to get people to buy a full reading, which included reading one’s future. Secondly, we suspected that they would say we would need to buy some talisman or some feng shui item. Nothing wrong with all that. After all, they were making a decent living. It was just that we are people savvy with the Internet. 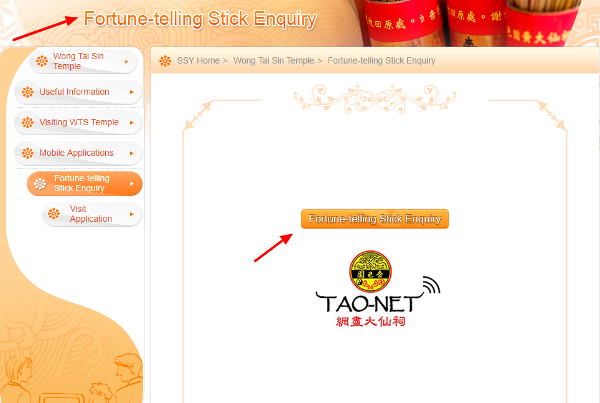 And we know that there is a FREE online interpretation of Fortune Sticks from Wong Tai Sin Temple. And here, I share with you the same Free service. 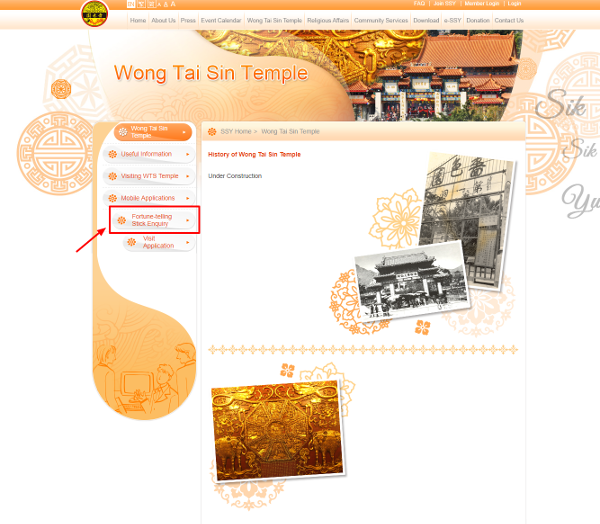 First step – Go to Wong Tai Sin Temple website – Click Here. You will land on their home page as shown below. Next, click on Fortune Telling Stick Enquiry option, indicated above in red box and pointed by red arrow. You will then be brought to the enquiry page as shown below. 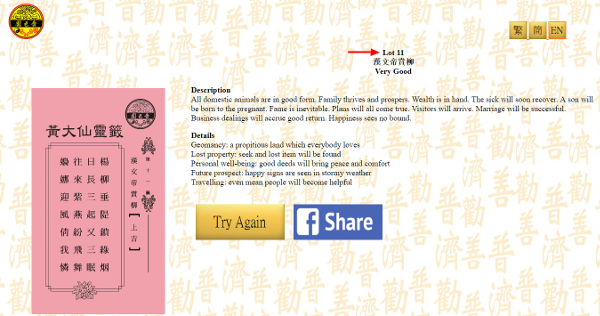 On this page, click on the Fortune Telling Stick Enquiry button. You will then see this next page, shown below. Remember the number on the Fortune Stick that you drawn during the Kau Cheem? Enter that number into the box (where the red arrow is pointing), and click the search button (that is the magnifying glass next to the box). The system will then search for the Interpretation and display it to you. Here is an example of the interpretation for Fortune Stick 11, also called Lot 11. 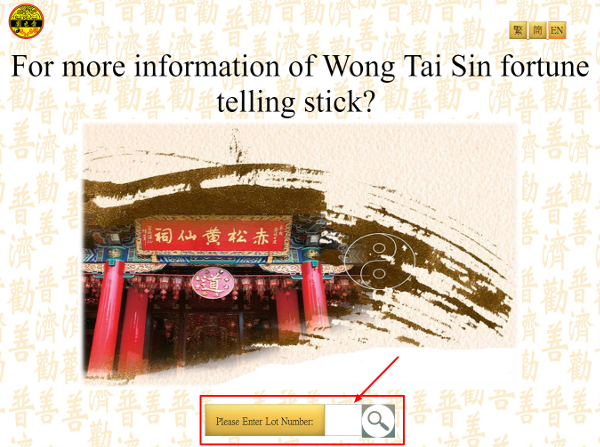 Now you have your Free online interpretation of the Fortune Stick you received at Wong Tai Sin Temple. Great huh? After the Kau Cheem, my friends and I walked the grounds a bit. It is not large. But there were some cute little statues that I would like to share with you. 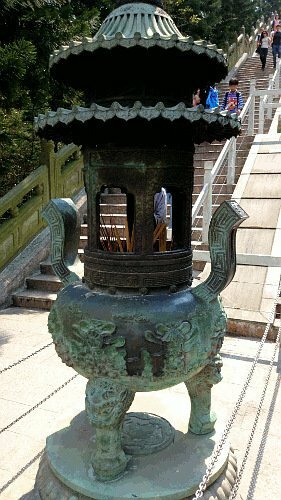 The above is a statue of a Kirin or Qilin. 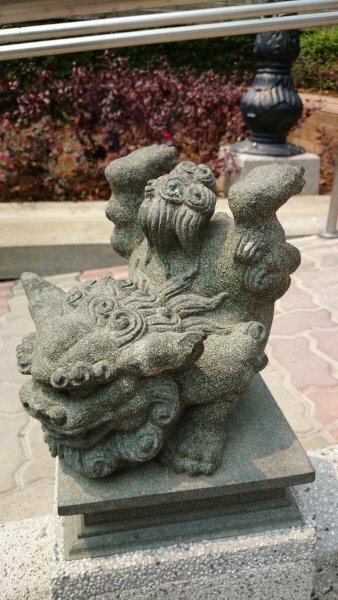 It is a mythical creature that is believed to bring good luck. 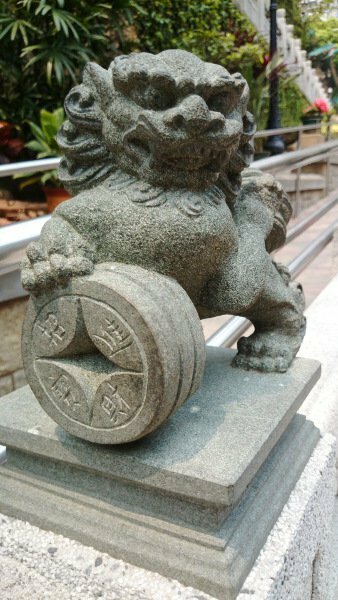 The above is a statue of a Chinese version of a lion. Lions are believed to be guardians. This particular one is holding an ancient Chinese coin with the Chinese words – 招财进宝 (zhao cai jin bao). The meaning of the words is to usher in wealth and prosperity. If you are still wondering What To See In Hong Kong, I can assure you that Sik Sik Yuen Wong Tai Sin Temple is definitely a Must See. Besides the tourists, you can truly immerse in a piece of local culture. This is because many locals still frequent this temple. You can truly soak in the energies of their devotion. Feel the power of belief in the locals for this deity. And in doing so, you too can believe and make a wish or ask for guidance. 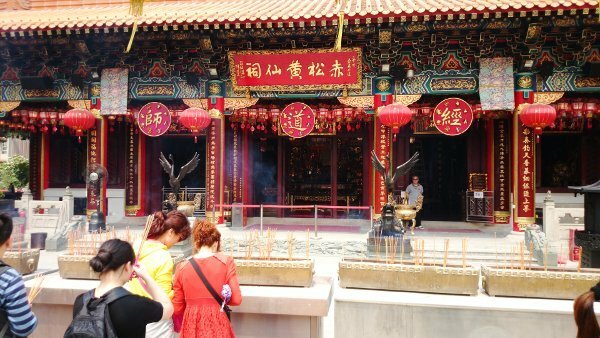 Where Is Sik Sik Yuen Wong Tai Sin Temple? This place is in Kowloon. 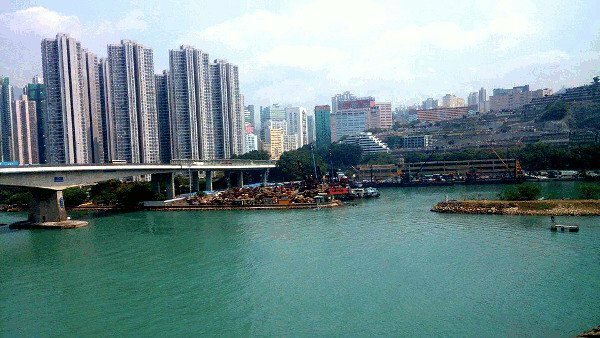 So, if you are staying in Kowloon, it will be near for you. But not to worry. Even if you are staying on Hong Kong island side, you can still take the MTR to here. See the map below. 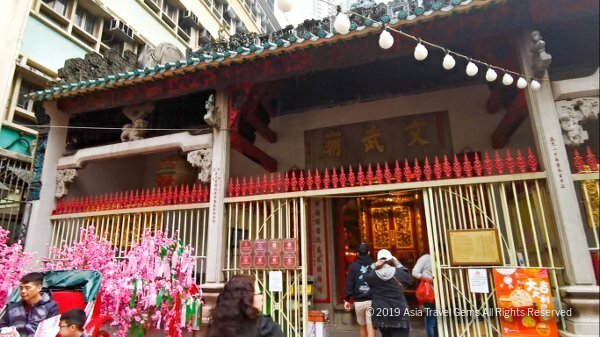 How to Get to Sik Sik Yuen Wong Tai Sin Temple? Take the MTR to Wong Tai Sin MTR station. Take the Exit B2. The temple is next to the station, about 3 minutes walk from the station. It is easier to take the MTR. Leave the bus for other activities. It can be easy to catch a cab in Hong Kong. Just hail them along the streets. Drivers are required to go by taximeter. Always ask for a machine-printed receipt. If unavailable, ask for a hand-written one. 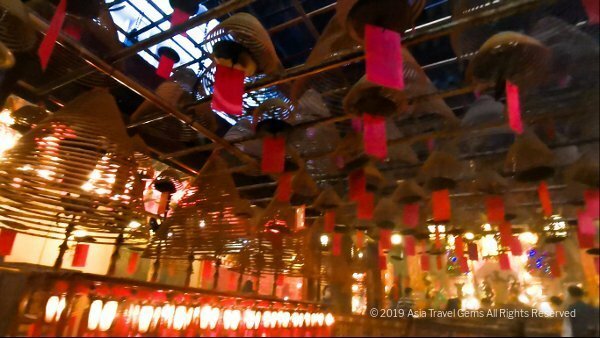 If you have ANY questions about this post – What To See in Hong Kong – Sik Sik Yuen Wong Tai Sin Temple, or Hong Kong, ANY at all, please submit your questions as comments below. I will be happy to help you out. 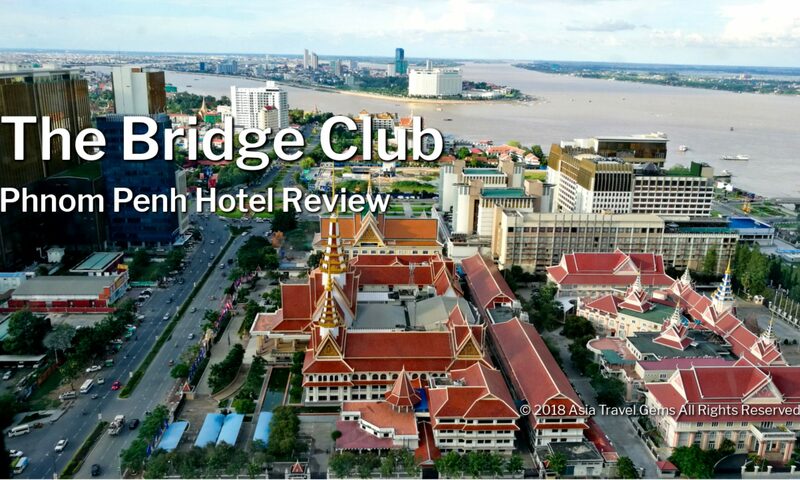 It was the last day of our vacation, and we had a bit of time to kill between breakfast and checkout from Residence G Hotel where we stayed. After a delicious morning meal, we headed to Nathan Road, via Kimberly Road, where we knew there would be some morning shopping available. 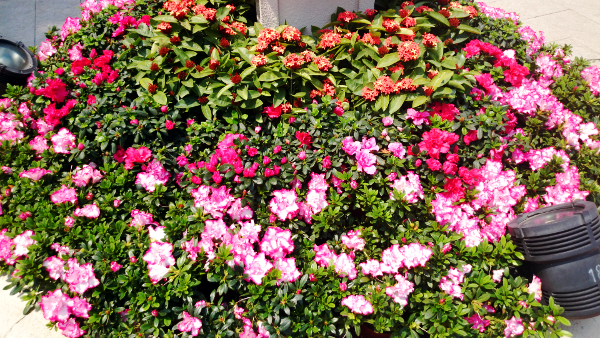 As we shopped along Nathan Road, I noticed an entrance to Kowloon Park. I encouraged my friends to enter the park. 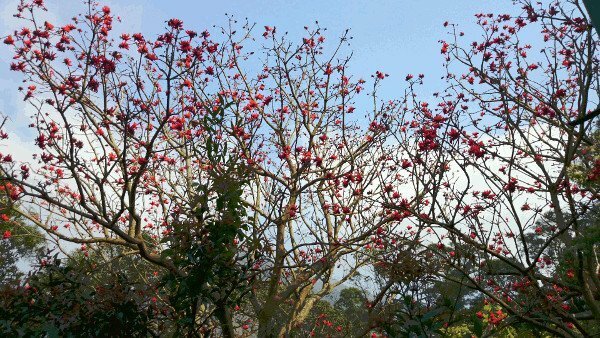 It would be nice to see some nature in Hong Kong, I said. 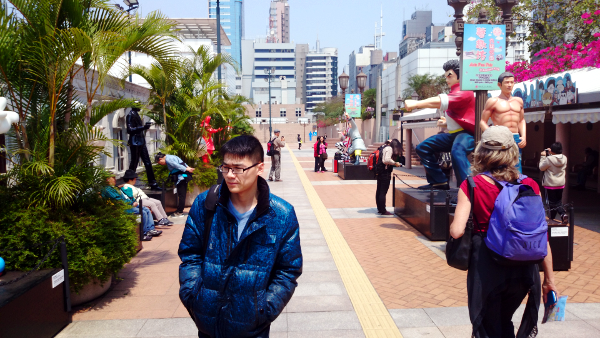 They agreed, we walked into the park, and discovered a pleasant surprise – the Hong Kong Avenue of Comic Stars! If you like to know what are the Things To Do in Hong Kong, this is one of the places you must visit. Tip: Don’t follow Google Map’s direction. From our hotel via Kimberly Road proved to be shorter and faster. Plus, more interesting things to see along the way. We love comics! I could still hear the yelps of delight from my friends as we hurried to the row of comic stars. The Avenue of Comic Stars was opened on 28 September 2012. 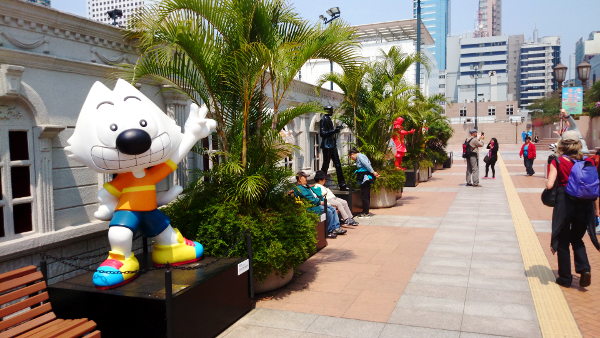 Colorfully painted sculptures of famous local comic characters lined the couple of hundred meters long pathway. 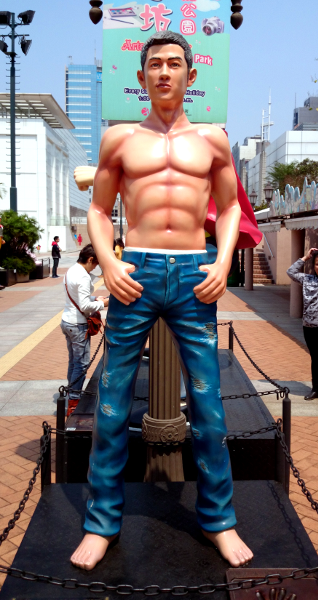 The statues are 1.8 to 3 meters high. Each comic character was created by distinguished local comic artists. A signage is placed next to each monument relating who is the comic character, which popular comic it was from, who is the famous comic artist as well as a bit of history of the artist. These sculptures sure brought a lot of fond memories to my friends and I. And I am sure they will do the same for the locals and visitors. 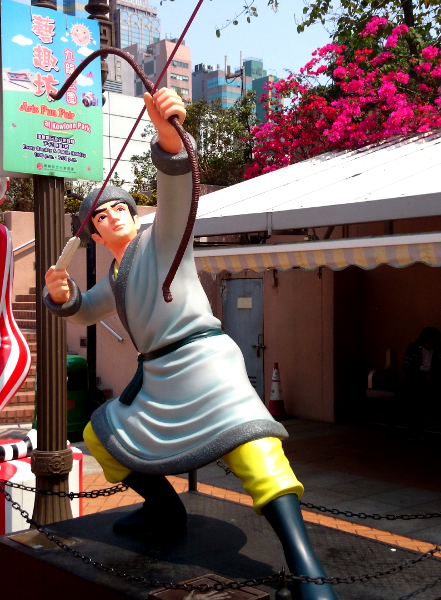 Those not familiar with this niche culture of Hong Kong (and Asia), can have the opportunity to learn a bit about it at this attraction. There are lots of arts and cultural activities frequently held at this location. 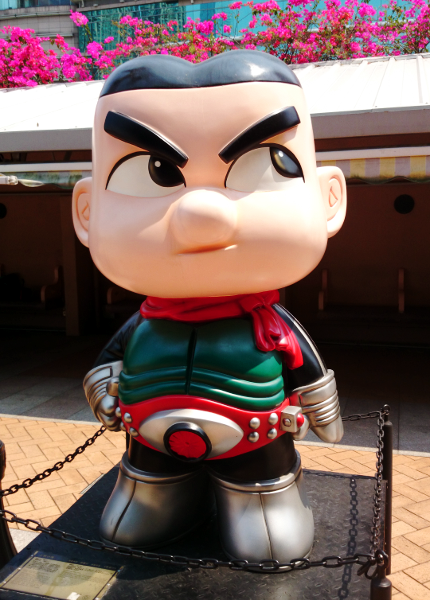 For example, in 2016, there was a large annual celebration that included demonstration of comic drawings, autograph sessions by famous comic artists, cosplay parade, and more! Do check out their website to see if any of the events happen to coincide with your visit. Here are the Comic Stars for you to enjoy viewing. I have reproduced the text from the signage placed next to each respective sculpture. The name of the Comic Character is above the image. Below the image, there is information on what Works the Comic Character is famous for, Who is the Comic Artist, and a little synopsis of the artist. 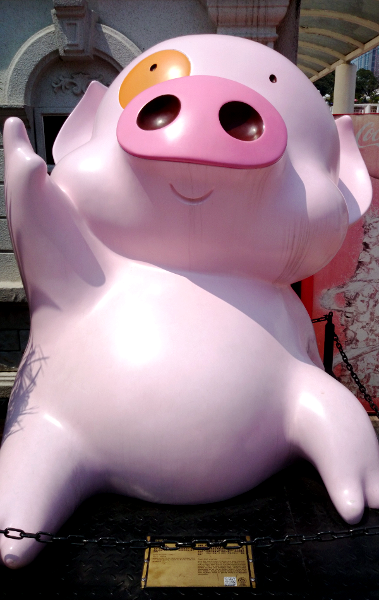 McDull is one of the most famous animated stars who always appear in films. Its first film is My Life as McDull. Alice Mak, the illustrator of McDull character. 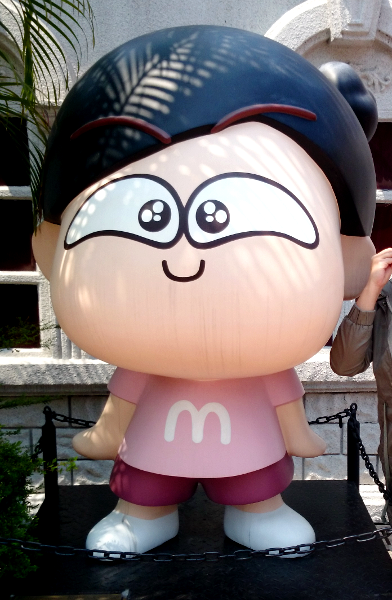 From 1990, she created the McMug and McDull series with co-creator Brian Tse and licensed a series of related products. With the great popularity of characters, she started devoting into animation films, movies known respectively as My Life as McDull, McDull, Prince de la Bun, McDull – Kungfu Ding Ding Dong and McDull, The Pork of Music, which all gained strong and reputable recognition. Magical Weapons is the first weapon-themed martial art comic with elements of fables. The story is centered on weapon, Heaven’s Crystal, forged by the Celestial Goddess to Eradicate Demon, and a cursed weapon. In Jin Dynasty, on the day the Nan Gong Clan received the Courts’ honour, the leading evil sect came to attack. 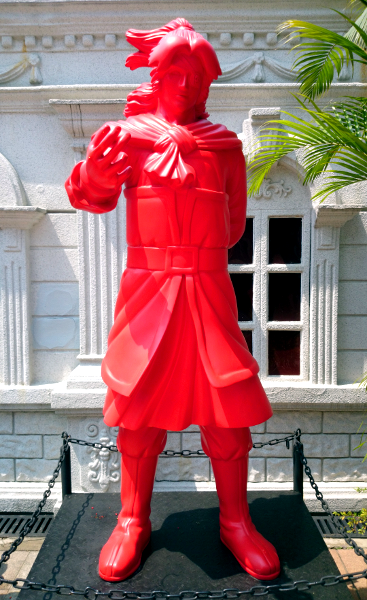 Nan Gong Yi, the Chief of Nan Gong Clan, defended with the power of the Heaven’s Crystal, which gave off a huge blast, realizing its curse, Nan Gong Wen Tian, the leading role, is the descendant of Celestial Goddess and the master of the Heaven’s Crystal. He became the chief of the martial art circles and lived his entire life righteous, brave and kind. With the phoenix heart, he is a demigod and lives eternally as a loyal guardian to the earth. Wong Yuk-long, Tony was born in Jiangmen, Guangdong Province in 1950, and immigrated to Hong Kong while he was 6. Started from aged 10, he submitted his pieces to the press, which were posted by The Chinese Student Weekly Reunion, Youth Park, etc. He joined the comic industry since 13 and determined that comic creation as his lifelong career. During aged 17, he built up his own publisher, and was totally responsible for creating, drawing and publishing. Wong established Jade Dynasty Group Ltd. in 1993, Jade Dynasty Multi-Media Ltd. in 2003 and Hangzhou Yulang Animation Company Ltd. in 2011. Miss 13 Dots is the only daughter of a local millionaire. While being lively, independent, avant-garde, and fashionable, she also cares about the people with her charitable mind and a strong sense of justice. She likes to conjure up unusual ideas and act chivalry with her friends. Lee Wai-chun is an esteemed Hong Kong comic artist. Having studied Chinese painting at college, she started practicing comic illustration in the 1960s. Her best-known comic is the classic Miss 13 Dots published in 1966. The comic started the trend of girl’s comics and was very popular from 60s to 80s both at home and abroad including Southeast Asia. The heroine Miss 13 Dots is an independent avant-garde, and fashionable girl who breaks the concept that women are inferior in Hong Kong society. The comic The Legend of the Condor Heroes was adapted from one of the most representative novels of Luis Cha. Its protagonist Guo has a sharp hero image and stands out among the heroes created by Cha as an embodiment of orthodox moral values and traditional chivalry. As an undeniable master, he became the most successful fictional character in Cha’s novels. Lee was born in 1963 in Hong Kong. He is a member of the HK Contemporary Artists Association and an honorary advisor of the HK Comics and Animation Federation. He has been honored and received many awards. 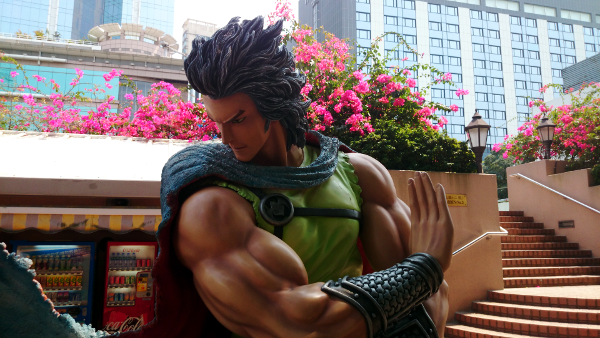 For instance, in 1993, on behalf of Culturecom Comics, he collaborated with SCHOLAR, a Japanese publisher to release the comic Romance of the Three Kingdoms, making an instant hit in both Hong Kong and Japan. 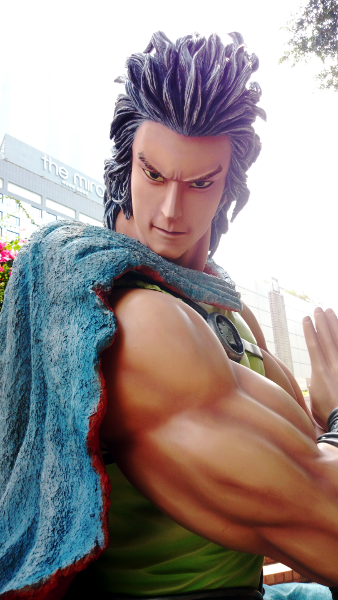 Lee became the first Hong Kong artist to successfully tap into the Japan’s comic market. In 2007, his work Sun Zi’s Tactics won the Gold Award of The 1st International Manga Award by the Japanese Ministry of Foreign Affairs. Sau Nga Chun is the forerunner of today’s typical Hong Kong girls while her age, measurements and star sign are all unknown. Being boastful, greedy, calculating, and lazy, she was already unneeded by the society. Lately she was seen making a living as a parallel goods importer carrying milk formula to the mainland. For the time moment securing seven meals a day and finding an accommodation have not posed a problem to her. 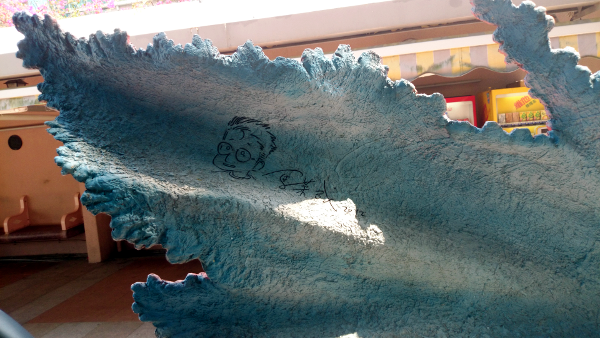 Gum emerged in the comic field when he was 16 as a mentee of Sueng-kun Siu Wai. He joined Jademan Comics at 19 and became primary author at 21. He has worked for publishing houses Jonesky Limited, Freeman Holdings Limited, and Cuturecom Holdings Limited before setting up his own comic publisher. 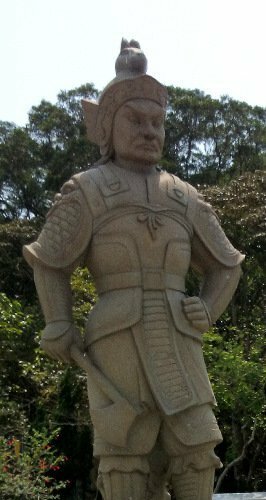 Liaoyuan Huo is the chief of mercenary assassins “Handicapped Warriors”. Being brave and smart, he has been taking thrilling and mysterious tasks from the Sima clan. Subsequently he found his goal in life and decided to embark on the warring front. Eventually he became the invincible warrior of the time. Chan was an employee of an advertising company in Hong Kong. He entered the comic field in 1996 after winning the sixth Tongli New Comic Artist Award (youth bracket) with his first short comic, Unhuman. 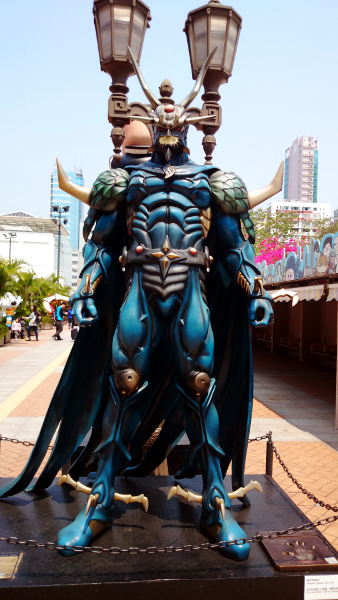 In 1999, his sci-fi work God Pretender won the Best Art award in the 3rd Asia Manga Summit. In April 2001, he published The Ravages of Time, a break-through to conventional literature about the Three Kingdoms Era with a new viewpoint and humanity. The comic is sold in 8 major countries and different cities in Asia since it have been launched 11 years ago. The comic is rich in Hong Kong flavor. It explores silly and funny things from the boring life to crack readers up. Maggie Lau was an office lady before being a fulltime comic artist. In Hong Kong Book Fair 2007, Little Horse’s Silly Life recording funny events in her life daily was released which immediately topped the selling chart. In December 2007, Little Horse’s Silly Life 2 was released, which was once sold out. The following years saw a number of sequels invariably climb to top of the selling chart, which is an incredible achievement in the industry. Her success also aroused the interest of major organizations inviting her for co-operation to launch products and host exhibitions. 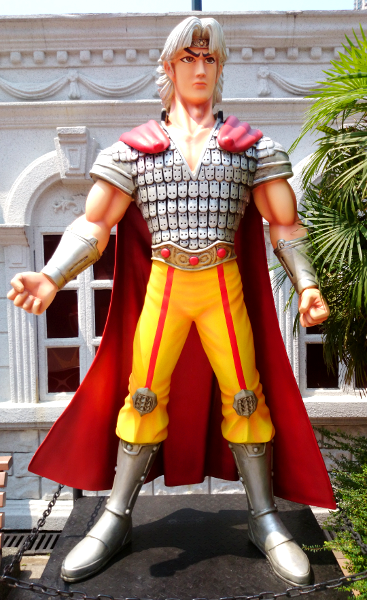 Tiger & Dragon Heroes is the most long-standing local comic strip in Hong Kong, and also the most representative piece of Wong Yuk Long. The theme of the story revolves mainly around brotherhood and the fight for justice. Wang Xiao Hu, the leading role, is a guy with a strong sense of justice and great fighting skills. he met his elder brother, Wang Xiao Long, and Shi Hei Long, who became best friends. They then formed a martial art school to make the quintessence of Chinese Kung Fu widely known and punish evil-doers. Wong Yuk-long, Tony was born in Jiangmen, Guangdong Province in 1950, and immigrated to Hong Kong while he was 6. Started from aged 10, he submitted his pieces to the press, which were posted by The Chinese Student Weekly Reunion, Youth Park, etc. He joined the comic industry since 13 and determined that comic creation as his lifelong career. During aged 17, he built up his own publisher, and was totally responsible for creating, drawing and publishing. Wong established Jade Dynasty Group Ltd. in 1993, Jade Dynasty Multi-Media Ltd. in 2003 and Hangzhou Yulang Animation Company Ltd. in 2011. Hui Lok, an all-around designer and creator, partners with his friend Jerry to start up an advertising firm. Unlike Jerry, he stresses loyalty in relationship, and is dissatisfied with Jerry’s loose romantic attitude. Hui Lok is so much into Cherie and regards her as a perfect goddess. Although Cherie does not feel for him, he is willing to be her guardian angel, selflessly devoting his care and love. Jeffrey is well known for his comic Feel 100%, which has been adapted into films and TV series, owning the hearts of youngsters. In 2008, in The 2nd International Manga Award by the Japanese Ministry of Foreign Affairs, his work stood out among 368 entries from 46 countries and won the Gold Award. In recent years, he has been invited by universities, schools of professional education, primary and secondary schools to give seminars and join in various exchange activities, sparing no efforts in promoting arts and culture and the creative industry. K is a story of a Chinese agent refitted from the 007 story with the inclusion of light jokes in his exciting tasks. Like James Bond, K retains a loose in romantic attitude and hero-like characters, and also shares human’s weaknesses. The difference is that his Chinese identity is highlight in the story. Embarking on the comics industry in 1982, Li left Jademan Comics a month later to pursue his comic career as an independent artist. His works were issued in Japan and published in Taiwan and France. In recent years, he took up art in other forms which helped take his comics to a new level with these art elements. White Cat Black Cat was created in 2004. The white cat Q Boy is curious about everything and willing to ask (Q stands for question). His uncle, the black cat Doctor A, is an erudite scholar (A stands for answer). Their interaction enables children to learn efficiently and happily by reading the funny comics. A renowned local comic artist, he has served as art director and creative director in newspaper and magazines. In the 1990s, he worked as a full time comic artist and illustrated comic columns in major newspapers covering current affairs, politics, and humour. In 2004, he collaborated with Fong Sha Mei on the White Cat Black Cat series and more than 300 books were published in eight years. The comic not only includes an endless stream of jokes, but more importantly marries humour with knowledge. It is loved by children and recommended by teachers and parents. Andy Chan is the hero in Teddy Boy. With the underworld background, the comic is a faithful reflection of all walks of life through the happenings and fates of its characters. Andy, in particular, who was once a heroic youngster, has mellowed as he turned middle-aged like any other man. When Man Kai Ming started to work in comic field at the age of 13, the comic industry was blooming. He worked for many comic production companies, including newspapers Kwong Pao, Hei Pao, Ching Pao and Kam Pao. After years of experience, he started his own publishing house in 1992 and officially released its debut title Teddy Boy. Like no others, Teddy Boy changed to be issued every 3 days in 2003. The practice continued on today and now it’s published 1,500 issues. God Legion revolved in the Shang and Zhou dynasties in China, when human co-habited with gods on the earth. The gods had superior wisdom and strength, and human beings were in awe of and obedient to them. The protagonist of the story is Doggie, an offspring of a human and a god. Disgruntled at the gods’ long-term suppression and ruling to humans, he decided to challenge the god’s authority. Cheng engaged in comic field in 1992. After working under Kwong’s Printing Company Limited and Ocean Creative Company Limited, he left for his individual career. he was the editor in chief of The Legend of the Devil Vol. I to III, Jedi Skywalker, Quadra Spirit, Violet Infortune, Valkyria Phoenix, Fire Dragon, Shadow Killer, God Legion and Wild Wolf and Mary. Cowboy was created in the 70s and early 80s. The whole series, which came in 40 volumes, tells what happened in Cowboy’s family, especially between the father and son, in a fun and warm way and reflects the community of Hong Kong. Using limited words except short titles, the cartoonist manages to tell stories vividly with pictures only. 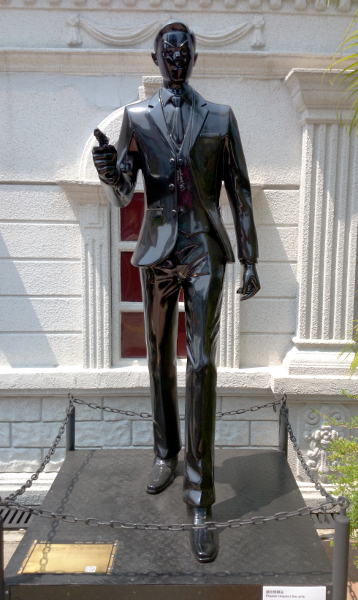 The Macau-born artist was originally called Wong Wing-hing. In the 1950s he was a teacher in Macau and learnt illustrating after work. In 1965, he was employed by Ming Pao. On one hand he cooperated with Alphonso Wong with a comic series Old Master Q and Godfather, on the other drew illustrations for Louis Cha’s novels. During 1971 and 1980, he composed 4-panel comic strips, including Father and Son. Cowboy Debussy and Gorgeous Susan, whereas Cowboy was later compiled into a 40-volume comic book and was very well received in the market. Din-dong, a silly cat kept by the illustator, is full of positive energy and dreams. It likes to collect surplus resources. 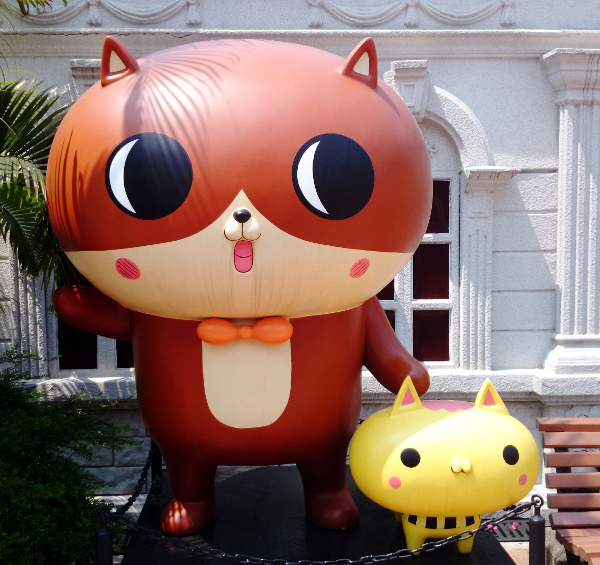 Exhibitions featuring Din-dong were showcased in LCX at Harbour City, Olympian City and APM in Hong Kong as well as The National Museum of Emerging Science and Innovation in Japan. It won the 4th Asiagraph Jury Special Work from Japan, and its animation was broadcast in Nippon Television Network Corporation and the 34th Hong Kong International Film Festival. Postgal Workshop is a two-person comic group which Pam Hung is mainly responsible for the content while John Chan for the graphic. The name “Postgal Workshop” is a homonym of “cat flea” in Cantonese since they think that people living in the world alike a tiny cat flea when compare with the universe. The duo received Hong Kong Arts Development Awards – Awards of best Artists. Their works were awarded the grand prize in Japan TBS animation competition afterward they were interviewed by The Daily Yomiuri. The comic Bruce Lee was created in 1971, inspired by a movie, The Big Boss. 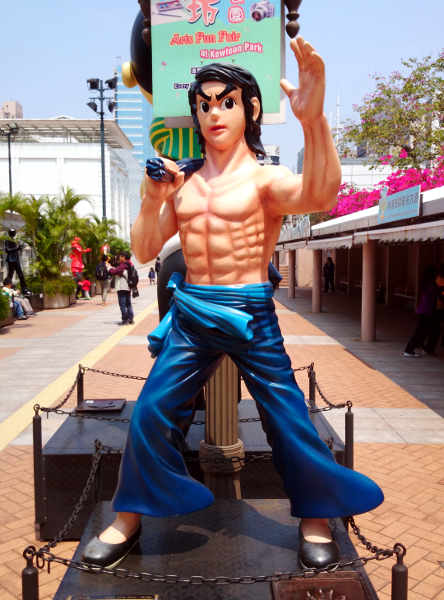 Despite being in hard times, the comic managed to make breakthrough with an innovative idea, making comic with martial art and combat theme as the mainstream in Hong Kong. The legendary title is one of the longest running comics in Hong Kong publishing for almost 40 years. Thanks to the conscientious illustrator, the series did not come to a break until 2009. Kwong followed his brother to join the industry at the age of 11. In 1971 he started the long comic strips Bruce Lee, whose circulation was on par with Tony Wong’s Tiger & Dragon Heroes. 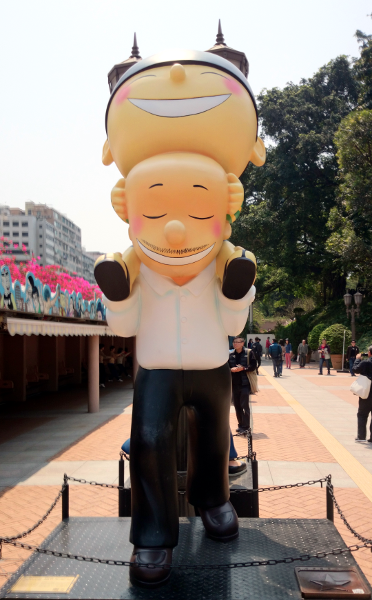 It is also one of the longest running comic strips in Hong Kong. In the mid-60s, he founded Good Friend Comics Journal and Peter Pan Comics Daily; in the mid-70s he founded comic papers such as Hei Pao and Comic Strip Daily. After a brief spell in Jademan Comics, he established 82 Comic House and Kwong’s Printing Co. Ltd.
Tiger Shark, the most representative figure in the Tiger Shark series, has a mighty fist with a million self-destructive horsepower. The crux of the story comes when his ultimate move was used. With too much power to bear, the move set its user’s body to blast. The illustrator wished to express all feelings in life in one move. Like it is said that a person reviews his entire life before his death, the self-destructing move unleashes all experience, feelings and life of its users. Wan has been in the comic field over 20 years. Strongly influenced by western culture and different film and comics, he created many renowned titles with different skills. Better known ones include If I Were King, Black Leopard, as well as Tiger Shark and Warlord published by Ocean Creative Company Limited, a publishing house he founded. Wan wishes his work would appeal to readers of different age groups and stimulate their interest in comics. He finds these are more meaningful compare with fame and fortune. The almighty Old Master Q is regarded as “Chinese Superman” by readers. Being humorous, imaginative, indignant to injustice, righteous, adventurous and unbounded, Old Master Q is as good as bad. He upholds traditional Chinese values but struggles amidst Chinese and Western cultures. Old Master Q has no lack of friends. Apart from Big Dumb, Mr. Chun, Old Chiu, his girlfriend Ms Chan, he has the acquaintance of many female friends, pets, monsters, and even aliens. Comic artist Alphonso Wong who was originally named Wong Kar Hei, was born in Tianjin. After moving to Hong Kong in 1957, he began drawing comics with pen names including Budding. In the 1960s he started Old Master Q series under his eldest son’s name Wong Chak. The lively and funny comic has since been readers’ favorite. His eldest son Wong Chak continued his father’s creation. To distinguish the two, readers call (the comic artist) Senior Wong Chak while (the architect) Junior Wong Chak. The fire-natured Dragon Lord is a warrior from the heaven responsible for safeguarding the artefact Sky Fixer. The universe lies different beings, including mankind, ghosts, demons, and gods, each of which is governed by its own rules and impenetrable to others. The Sky Fixer is an artefact maintaining the balance of the universe. He secretly mounts surveillance on every evil power on earth in the human world. Khoo is one of the top comic artists in Hong Kong. Tons of readers in Southeast Asia are crazy about his publications. In 1992, he set up a publishing company with his friends to publish the hardcover version of Dragon Lord. It made a huge success selling more than 50,000 copies in Hong Kong. In 1993 he left the publishing company and joined Jademan Comics as art director until 2007, when he founded Lucky Dragon Comics & Animation Ltd. His publications include, Amazing Weapons 4, The 8th Copper Man in Shaolin, Kung Fu, Kill The King. Shau Sing Chai was a character in the 73 Comic Series. 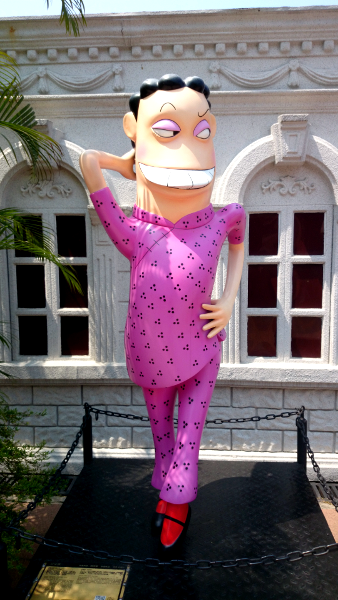 Using local Cantonese together with unique character modeling and humorous presentation, the comic was well received by readers. 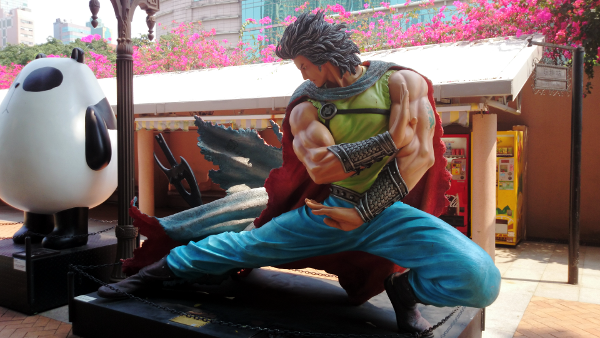 It is Hong Kong’s first comic that established its fan club and with which figurines and T-shirts were made. Shau Sing Chai is also the first comic open for readers’ contributions, nurturing many comic talents. The locally born comic artist entered to comic field at the age of 16. 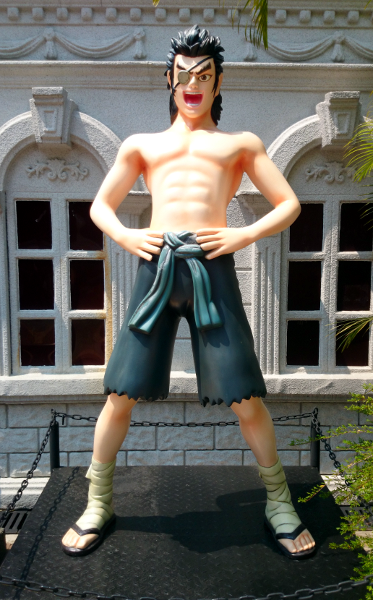 He became a comedian master in the comic industry with the release of Shau Sing Chai and Siu Keung Comic Collection. He is known to enjoy good personal network and ready to help bud artists. 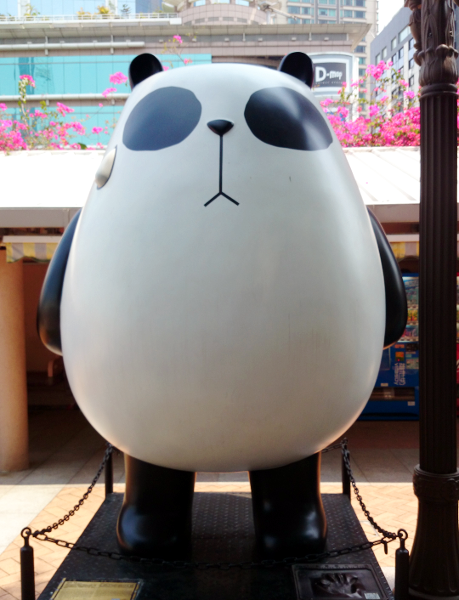 On On and Guy Guy were created by Siuhak in 2004, inspired by An An and Jia Jia, two giant pandas kept in the Ocean Park. Turning deaf ears to what they don’t want to hear, they make many dialectical jokes. The comic also ridicules the local instant culture, as well as local politics and current affairs. The two pandas often forget their own names; bearing a resemblance to Hong Kong people in post-handover era who have to recognize their identity. Having graduated in BA in Graphic Design (Hons) from the School of Design, the Hong Kong Polytechnic University in 1996, he freelanced in local illustrations, comics and animations and scriptwriting. In 2004 he formed a comic group Springrolllll with Craig Au Yeung, Eric So, Yeung Hok Tak and Chi Hoi. From 2004 to 2008 he was a guest tutor in the School of Design, Hong Kong Polytechnic University and started to compose lyrics for canton pop. Storm Riders revolves around two fellow disciples, the arrogant Cloud and accommodating Wind. Neither friends nor enemies, they have gone through the turmoil in the underworld and thus joined hands to uphold orthodox moral. Now a millenary disaster is imminent, and the duo, having received the prophecy telling them what to do, is rising to fight with their lives in an attempt to avoid the havoc once and for all. Ma Wing-shing was locally born in 1961. Having been adoring painting, he started composing and drawing the fame making A Man Called Hero in 1982. By mid-1983, it was the best selling comic in Hong Kong with over 200,000 copies sold locally. 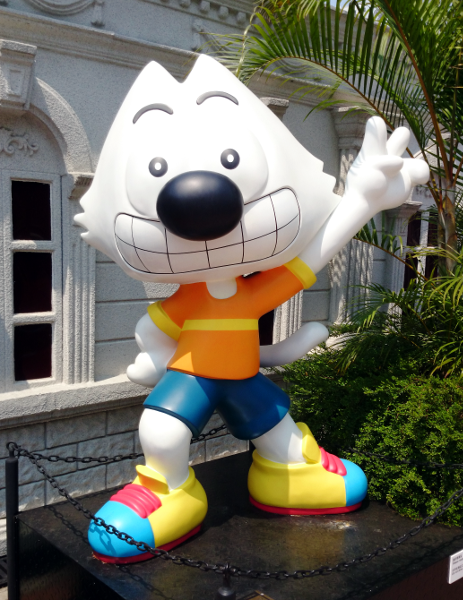 Ma innovated Hong Kong comics by introducing realistic technique, and cinematic expressions, making a far-reaching impact. Ma founded Jonesky Limited in 1989. Storm Warriors, which has been published for 23 years, always tops the selling chart of Hong Kong comics. He subsequently released many well-known comics including Black Leopard, The Heaven Sword and Dragon Saber, Flying Fox of Snowing Mountain etc, securing his leadership in the comic industry. This comic character, Cloud, deserve more photos. It is very popular, and the pose and detailing is superb. The famous comic artist, Ma Wing-shing, signed on this! 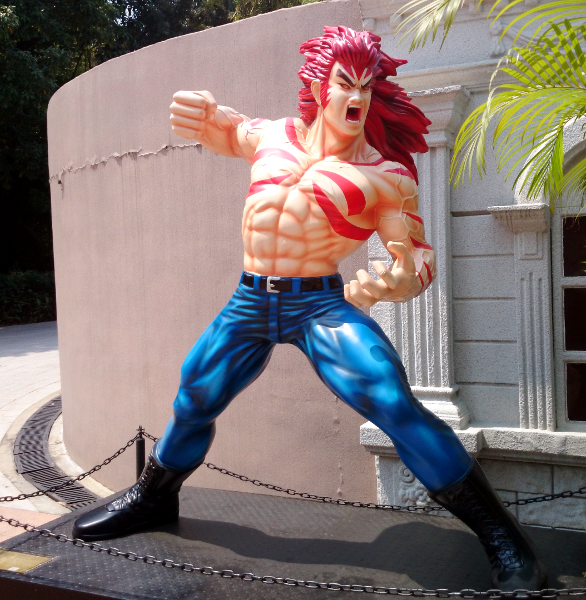 It is the statue of the popular comic character he created, called Cloud. Where is the Avenue of Comic Stars? 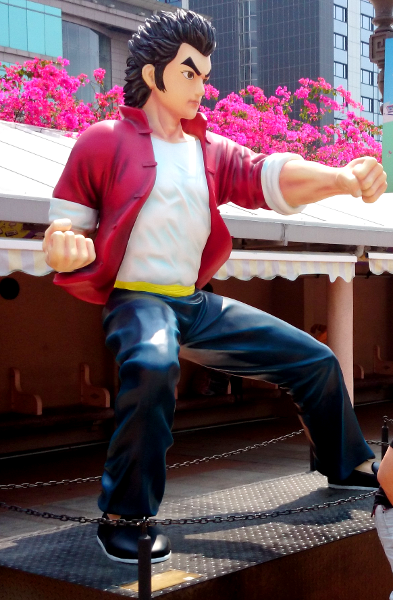 The Avenue of Comic Stars is in Kowloon Park. 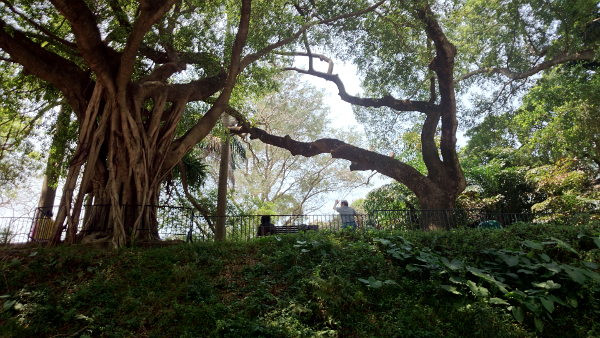 It is on the east side of the park, nearer to Nathan Road. 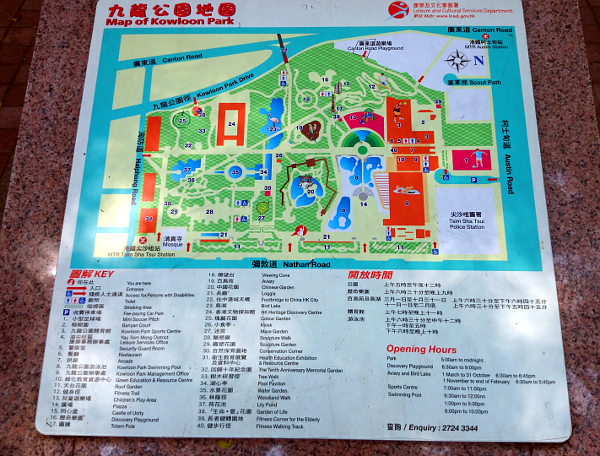 There is a map of Kowloon Park at the entrances. Lots of activities inside the park. People jog, there is a swimming complex, and in the early mornings you can enjoy watching people practicing martial arts and tai chi. Of course, the park will have beautiful flowers for you to appreciate. Tip: Slow down. Appreciate the pretty flowers. There are lots of tall trees that look really ancient. The sight is so enchanting. And made all the more charming with the sight of people practicing tai chi. East side of Kowloon Park, Near Nathan Road, Tsim Sha Tsui, Hong Kong. 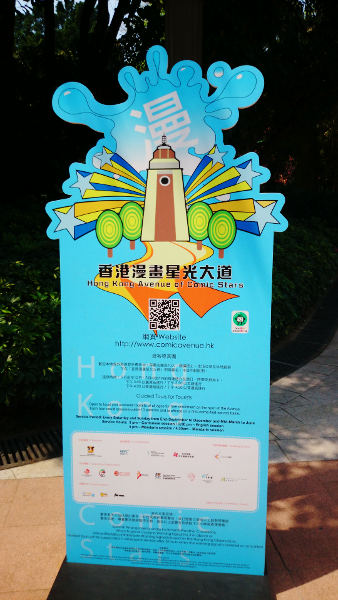 Visitors can enter by Park Lane Boulevard Entrance of Kowloon Park. Go To Tsim Sha Tsui Station > Take Exit A1 > walk along the left side of Nathan Road towards Jordan for around 5 minutes. If you have ANY questions about What To See in Hong Kong – Avenue of Comic Stars or Hong Kong, ANY at all, please submit your questions as comments below. I will be happy to help you out. After the morning of appreciating Tian Tan Buddha, we had a very good lunch at Po Lin Monastery Vegetarian Restaurant. As we had dessert at the deli outside the restaurant, we took advantage of the moment to rest a while. Soon enough, we were energized, and ready for our next adventure. 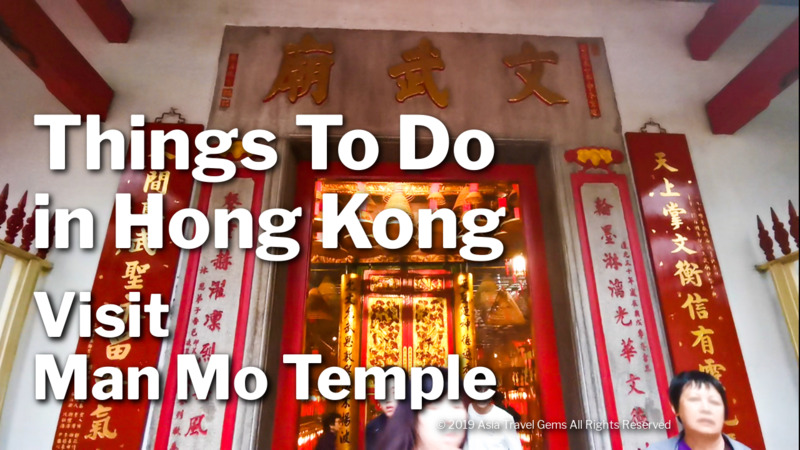 We wondered what are the Things To Do in Hong Kong next? We read about the Wisdom Path, and were eager to see it. 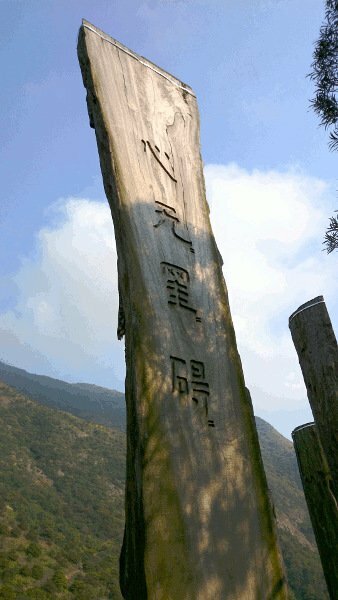 Wisdom Path features thirty eight (38) wooden monuments that are eight (8) to ten (10) meters tall. 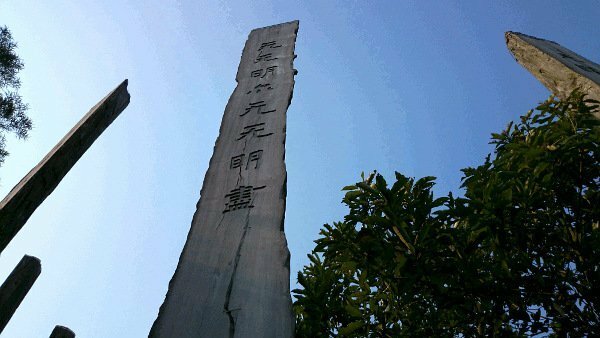 Each of these monuments, also called wooden steles, have Chinese calligraphy inscribed on them. The words of the calligraphy form phrases that are verses from the Heart Sutra. The Heart Sutra is one of the world’s best known prayers. 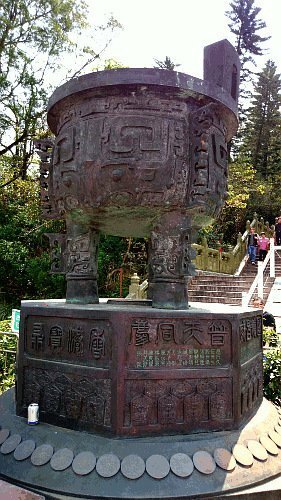 It is revered by Confucians, Taoists and Buddhists. The thirty eight (38) wooden steles are arranged in a figure eight configuration. This is to symbolize infinity. This amazing work of art was created by Professor Jao Tsung-I, and completed in May 2005. As we walked out of Po Lin Monastery, we noticed a pathway between Tian Tan Buddha and Po Lin Monastery. 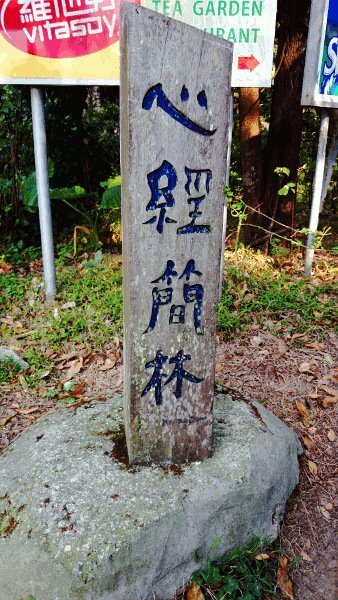 There were sign posts and one of them indicated that the pathway would lead to Wisdom Path. We walked about a few hundred meters before we found some signs that indicated the start of the trek to Wisdom Path. At first, we were a little confused. There were so many colorful signs promoting different brands of drinks. And there was one that indicated a Tea Garden Restaurant. There was a piece of stone just below all those signs. It took us a few seconds before we realized that it was a milestone that indicated the start of the trek to Wisdom Path. And if you looked really carefully, below the Chinese Words, there is a faded arrow that pointed the way. We began our trek to Wisdom Path along a narrow track. On the sides were trees, shrubs and all types of greenery. We could hear some soft sounds of creatures in the distance, and the occasional bird calling. And were surprised there were not more signs of fauna. Were they shy because of our presence? Tip: The Wisdom Path trek is quite long. Stay on track by following the signs and the beaten trail. Do not go off the track. Not far from the start point of the trek, we spotted Cherry Blossoms! We were quite amazed to find them there. More so because they were so unexpected. As we ventured further, we observed that there were the greenery was lush, and flora abundance. The air was sweet and dry. All of this made the trek absolutely pleasant, and treat for the eyes. Tip: Do take time to appreciate the trees and flowers. Some distance in, we came across what looked like an abandoned tea house. This could be the Tea Garden Restaurant that one of the signs indicated earlier. There was no one around, and it did not look like it was conducting business anymore. Tip: The Tea Garden Restaurant is another milestone. You know that you are on the right track when you see it. Opposite the Tea Garden Restaurant, there was a small field of shrubs. We wondered what they were at first. 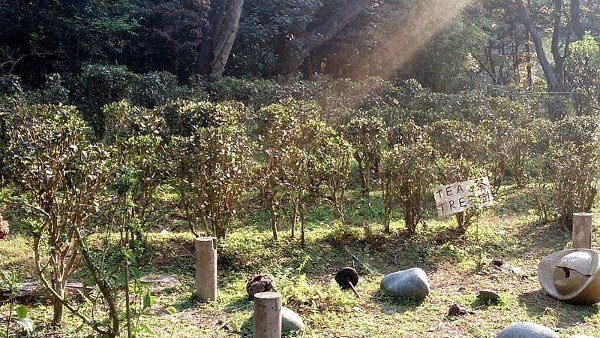 Then we realized that it was a small tea plantation. This was cool. It meant that the tea house used to serve tea that were grown there. So fresh! From the start of the trek to the Wisdom Path, it should take about twenty (20) to twenty five (25) minutes walk. Of course, it all depends on your speed of walking. Also, if you stopped to admire the flowers and tea garden, it would take a little longer. After the nice and pleasant walk, we finally reached the Wisdom Path. We did not expect what we saw. It was awesome. Another good thing about this attraction was that there were not many people here. We believed it was because not many people knew of this place. So, it was not crowded and very serene. The tranquility added a touch of spirituality to this place. We started to walk the Wisdom Path. Immediately, near the start of the path, there were the wooden steles already. 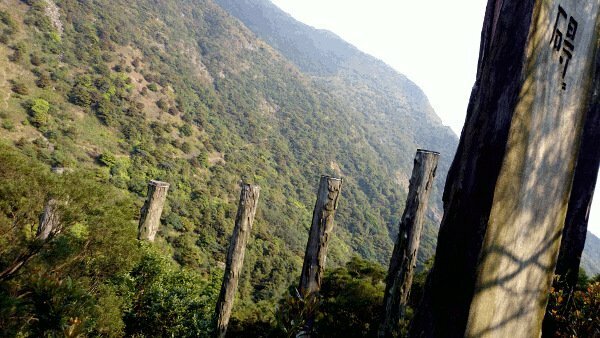 As mentioned earlier, the wooden steles were about eight (8) to ten (10) meters tall. They look magnificent, don’t they? From the photo above, you could see that they were almost as tall as the trees around them. 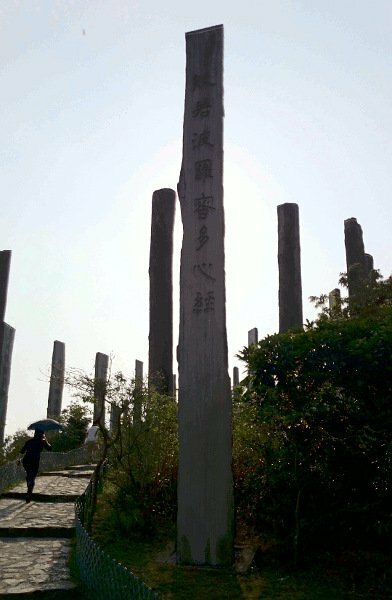 Below is the first of the wooden steles at the Wisdom Path. Below is a close up of the first wooden stele. It says that this is the Heart Sutra. It must be noted that not all the wooden steles are of the same breadth. Here is one that is a little broader. The piece of wood used is natural, like a large log that had been sliced for a surface to carve the calligraphy. As we walked along the Wisdom Path, we felt immersed into the experience. We were no longer watching like they were just an attraction. As we looked up to view each wooden stele, we felt such a sense of awe. And as we continued walking, there was almost a sense of losing oneself into the space, forgetting that it actually formed the infinity sign. Every once in a while, we looked around. Everywhere we looked, there were slopes and mountains. We could understand why this place was chosen for this representation of the Heart Sutra. We could not help but feel such a sense of appreciation by the beauty all around us. Here is a photo to share how it looked when we gazed upwards from the base of one of the wooden steles. Against the sunny blue sky, it was colossal and breathtaking. After the visit to the Wisdom Path, we exit from where we started. A look around, and we saw that to the left was a sign that said – Phoenix Hill. There were steps that invited people to explore the hill. Tip: The entrance to the Phoenix Hill is recognizable by a gateway and a statue of the Phoenix. It is on the left of the entrance of the Wisdom Path. Don’t miss it! We climbed the steps, and after a short distance, we looked back. 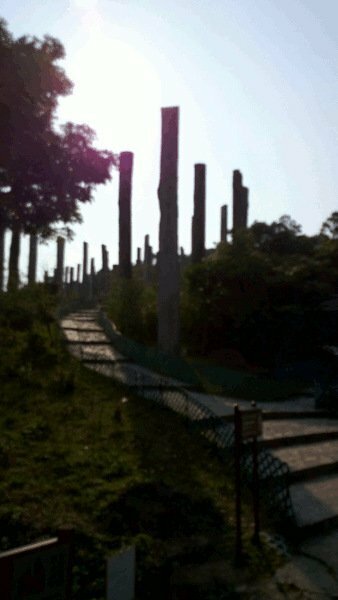 We were able to have a bird’s eye view of the 38 wooden steles of the Wisdom Path. Look closely and you could make out the infinity symbol cast by the wooden steles! 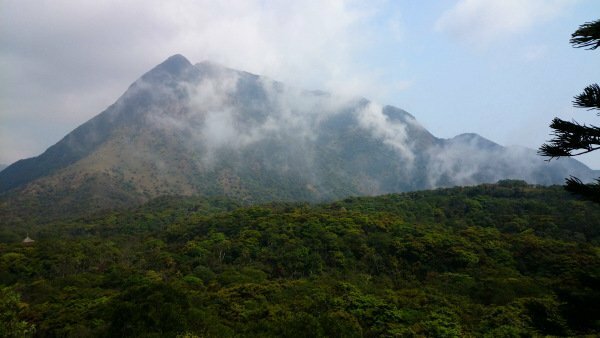 We walked slightly further up the Phoenix Hill, and were rewarded with a breathtaking view of the mountains and valley of the Lantau mountains, the islands and the South China Sea. We spent some time appreciating the majestic view. Soon after, we made our way back to Tian Tan Buddha. Where is the Wisdom Path Located? Go to MTR Tung Chung Station. Take Exit B. Then take the Ngong Ping Cable Car. This will take around 25 minutes. Or from the same Tung Chung Station, take New Lantao Bus 23. This will take about 45 minutes. Another way to get there is by Ferry, which you have to board at Central Pier 6. Take the ferry to Mui Po, then take New Lantao Bus 2 to Ngong Ping Village. All this may take around 40 minutes, minus wait time. What is the Heart Sutra? The Heart Sutra is a very popular sutra in Mahayana Buddhism. It has 260 words, and as such is the shortest sutra. Its Sanskrit name is Prajnaparamitahrdaya. The meaning is The Heart of the Perfection of Wisdom. The sutra records the conversation that Avalokiteshvara Bodhisattva has with one of the disciples of Buddha, Shariputra. They discussed the five skandhas that are form, sensation, conception, discrimination and consciousness. All of which are empty as Avalokiteshvara has observed, and thus became free from suffering. We will not assume to know all there is about this lovely Heart Sutra. The above is just a brief explanation. For more information, it is best to read up more about this sutra from Buddhist websites, attend talks by monks about this sutra, read books about it, or visit Buddhist libraries. If you have ANY questions about What To See in Hong Kong – Wisdom Path or Hong Kong, ANY at all, please submit your questions as comments below. I will be happy to help you out. If you are wondering Things To Do In Hong Kong that is a Must, it is the Big Buddha in Hong Kong Lantau Island, also known as Tian Tan Buddha, is an amazing sight to behold! It is so huge that it can be seen from an airplane as it approaches Hong Kong International Airport. During our last Hong Kong vacation, of course we simply must visit this awesome and magnificent Buddha image! 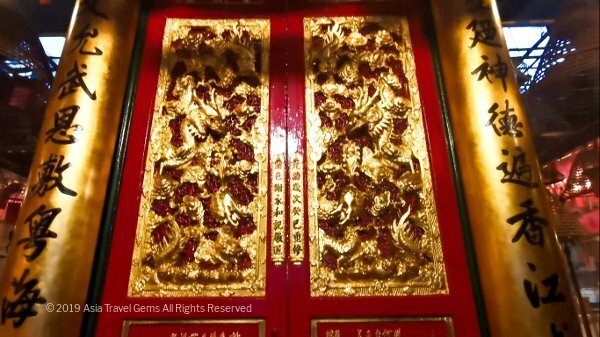 We were really eager and excited about this day trip to the island that also has many attractions such as the Po Lin Monastery, the monastery’s vegetarian restaurant, the Wisdom Path, and more. 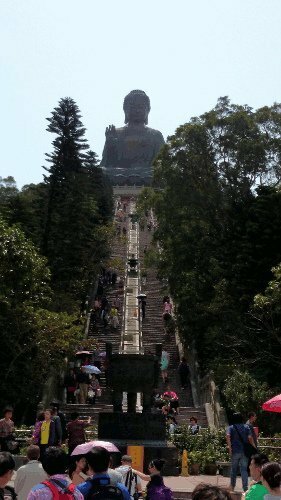 So, we had to travel from Residence G Hong Kong, which is located in Kowloon, to Big Buddha in Hong Kong Lantau Island. 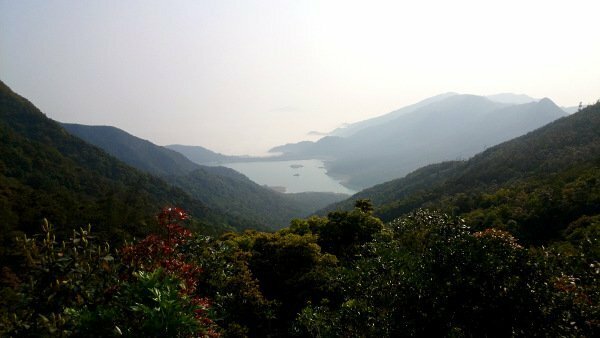 It is very easy and convenient to travel from anywhere in Hong Kong to Lantau Island. 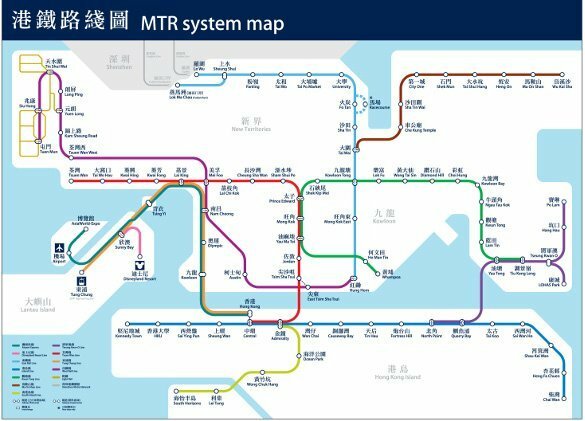 One of the most affordable ways is via MTR (Mass Transit Railway). The MTR has a vast network that can take you to almost anywhere in Hong Kong. Take a look at the map below (click to see a larger version of the map). The closest MTR station to Residence G Hong Kong, the hotel where we stayed at, is Austin MTR station. After early morning breakfast, we walked along Austin Road to the station. We took the train on the West Rail Line to Nam Cheong MTR station. Then transit to Tung Chung line towards Tung Chung MTR station. That stop was in Lantau Island itself. You can see the route on the map above. At certain sections of the train route, it went above ground. Nothing spectacular to see, but it was nice to get views of Kowloon as the train sped on to Lantau Island. 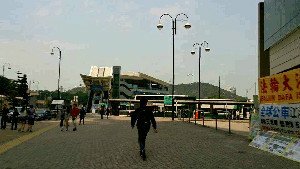 At Tung Chung station, there is a mall called Citygate Outlets. Initially, we thought of spending some time there to browse around, and perhaps get some great deals. It is, after all, a factory outlet, supposedly selling stuff at much lower prices. Tip: Truth about Citygate Outlets – our Hong Kong friend informed us that the product range at this mall is not good. The fashion is not the latest, and the discounts were not really worth it. A taxi driver later confirmed this with us. Apparently the locals know this. Only tourists were in the dark, thinking there are good deals because of the word ‘outlets’, which is supposed to mean stuff at much lower prices. They are not. After finding out the truth, we decided not to shop there. Still, the mall has a good use though. The train ride from the hotel was not too long, but long enough. And it may be another half an hour to one hour to Ngong Ping, Lantau Island where Tian Tan Buddha is located. So we took advantage of the nice and clean restrooms there, and had our restroom break. It was supposed to be an entire experience. We had planned and intended to take the Ngong Ping Cablecar to Ngong Ping. 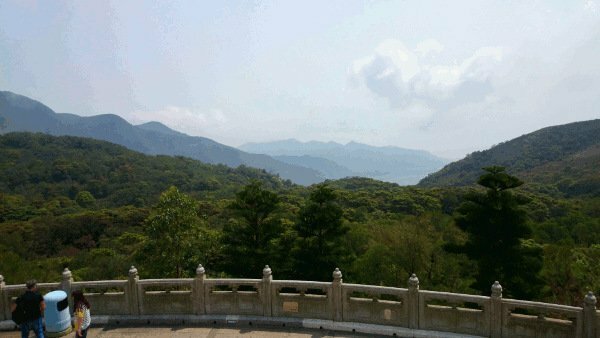 That is where Tian Tan Buddha, Po Lin Monastery and Wisdom Path are located. Unfortunately, when we reached the cablecar station, we were informed that the entire service was down due to maintenance. We had no choice but to take the bus to Ngong Ping. We were a little disappointed as we wanted to see how the view as the cable car ‘flies’ over to Ngong Ping. Nevertheless, the main event is the Big Buddha. So disappointment was quickly dissipated by anticipation. We discovered that the bus to Ngong Ping was bus number 23. But before that, we had to find out how to pay for the bus ticket. Tip: Get the Octopus card the moment you start to take the MTR around Hong Kong and Kowloon. It is very useful, convenient and saves a lot of money. When you first get the card, you need to pay HK$50 (refundable deposit) and HK$100 value for use. We were able to use the same card for the bus to Ngong Ping. No hassles. The queue for bus number 23 was very long. Fortunately, the bus arrives frequently. In less than half an hour, we were aboard the bus, and on our way to Ngong Ping. The bus ride was not really smooth sailing. Ngong Ping is at the top of a very high hill. The road to there has a lot of sharp turns and many curves that most probably circled the slopes of the hill. Tip: For those who are prone to air or car sickness, I suggest taking something to prevent that before boarding the bus. After some time, we finally arrived! 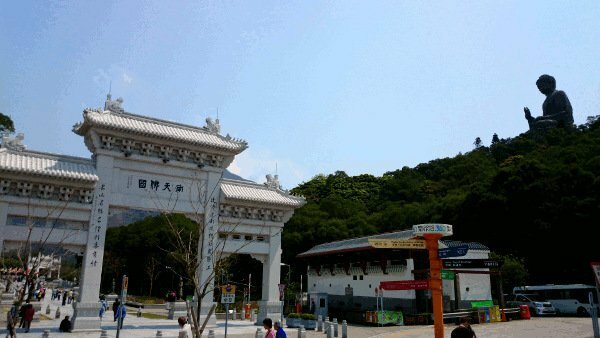 Here is the Gateway to Tian Tan Buddha! Yesterday, after we arrived, we spent half a day and night at Kowloon. And what a difference Ngong Ping was to Kowloon! 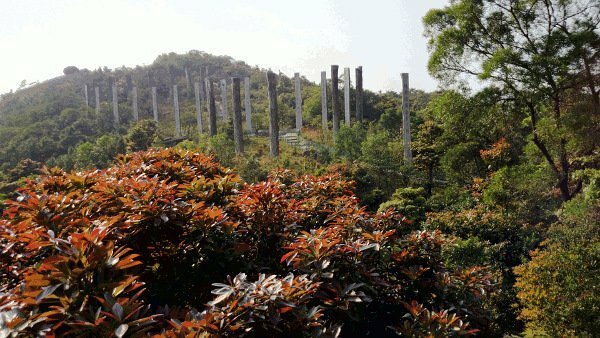 There were vast open spaces with lush greenery that filled the landscape at Ngong Ping. In contrast, there were tall and short buildings that covered every area in Kowloon, thinly separated by narrow roads. At Ngong Ping, I could actually feel my soul breathe. 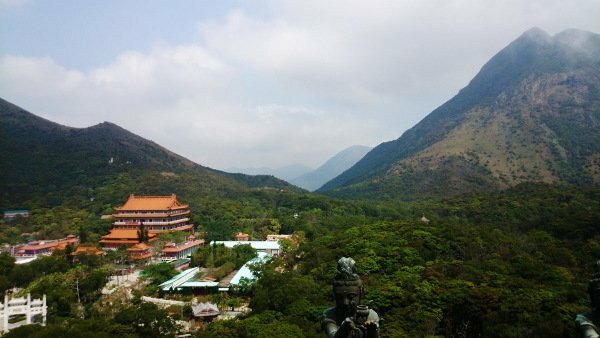 Tip: From the Gateway, it is awesome to see the Tian Tan Buddha sitting high on the hill. A sight you will never forget. Take a few moments to soak it all in. At the Gateway, we could see the monumental Tian Tan Buddha! (top right portion of photo above) Here is another photo of the Big Buddha as seen from the Gateway. Before reaching the actual Big Buddha image, there was a Bodhi Path that led to it. When we were there, and because the weather was also quite warm, the path looked really long. But it actually was not. Also, it was fun to spend a little time along this path. There were 12 Divine Generals placed along the pathway. Tip: Did you know that each of the 12 Divine Generals represent an animal in the Chinese Zodiac? Find yours, and take a photo with it! The one below was the Divine General for those born in the Year of the Rabbit. And then … the long and steep flight of steps to Tian Tan Buddha. Well, it was the climb we had to take in order to get a closer view of the magnificent statue, and to enjoy the sweeping scene of the mountains and seas. Tip: Oh wait! At the bottom of the steps, there is a booth that sells Meal Tickets. These are tickets to dine a set lunch at the nearby renowned Po Lin Monastery Vegetarian Restaurant. A Deluxe Meal is priced at HK$128 per person (as of March 2014). Choose the Deluxe Set Meal. You won’t regret it. And purchase the tickets here at this booth at the base of the steps. Reason: You also get FREE admission to the museum when you reach the Big Buddha. The artifacts, relics and art pieces are worth viewing. 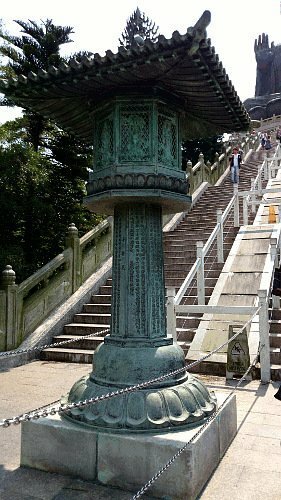 At the bottom of the steps and along the way up, there were many Incense Burners, Lamp Posts and mini Pagodas. Beautiful, isn’t it? Look at the intricate details. Here’s another one. We finally reached Tian Tan Buddha! The gigantic Tian Tan Buddha is made of bronze. It took 12 years to build, and was completed in 1993. It is 34 metres tall and faces north. This direction was specially chosen so that the Big Buddha looks over all the Chinese people. 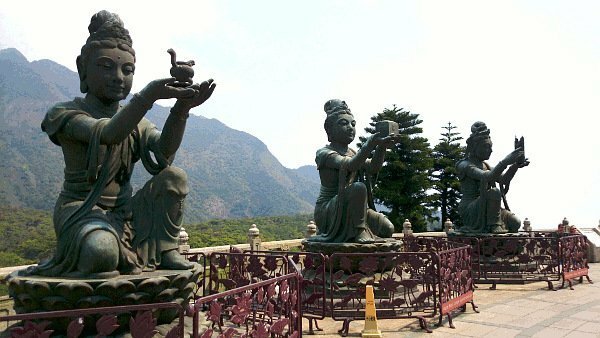 Why was the statue named Tian Tan Buddha? Its base is a model of the Altar of Heaven. Also, known as Earthly Mount of Tian Tan, which is the Temple of Heaven that is located in Beijing. 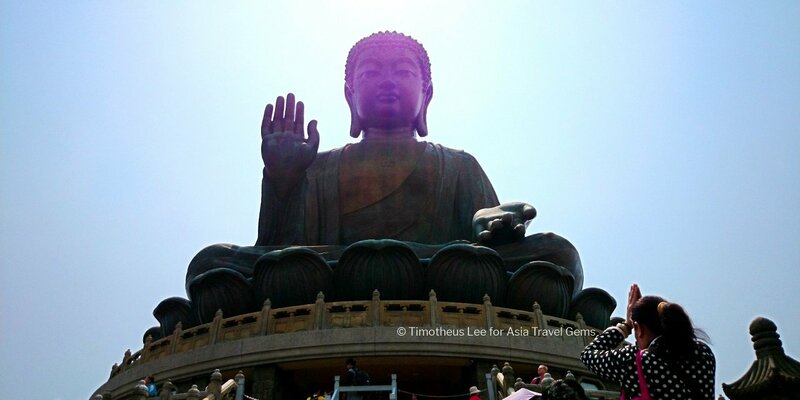 We hope everyone receives blessings when they see the images here of Tian Tan Buddha! The right hand of the statue is raised. This represents the removal of affliction. The other left hand rests on the lap. This is a gesture of generosity. Beneath the statue, there is a Museum. It comprises of 3 halls – the Hall of the Universe, the Hall of Benevolent Merit, and the Hall of Remembrance. There were many floors of ancient relics and Buddhist items on many floors. We even saw an Anita Mui shrine. But more significant was the relic of Gautama Buddha, the alleged cremated remains. That is what this Museum is renowned for, and why most people visit it. It was really worth a visit. Take note of the tip given earlier to buy the ticket at the ground level so that you get free entrance to this ethereal and blissful experience. Unfortunately, no photo taking was allowed. So we have no images to share of the Museum. At the base of the Big Buddha, there were six statues of Devas positioned all around it. As we took time to observe them, we noticed that each of these Devas has an item in their hands. 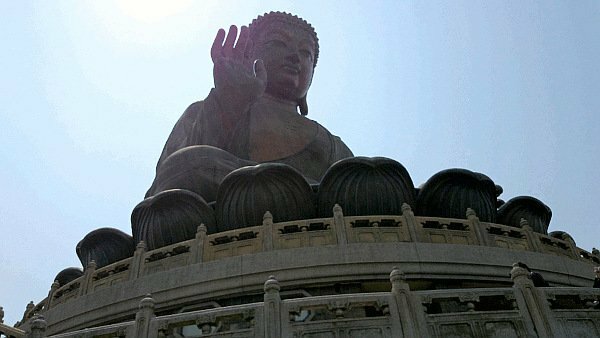 They were lifted upwards as if offering them as gifts to Tian Tan Buddha. These 6 bronze statues are known as The Offering of the 6 Devas. 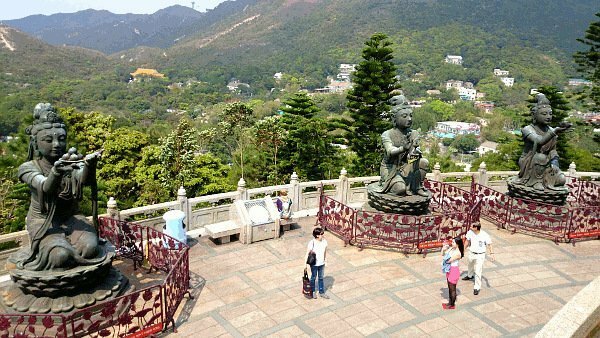 They are offering flowers, incense, lamps, ointments, fruits and music to Tian Tan Buddha. These items symbolize the 6 Perfections, which are zeal, patience, morality, generosity, meditation and wisdom. All necessary for enlightenment. 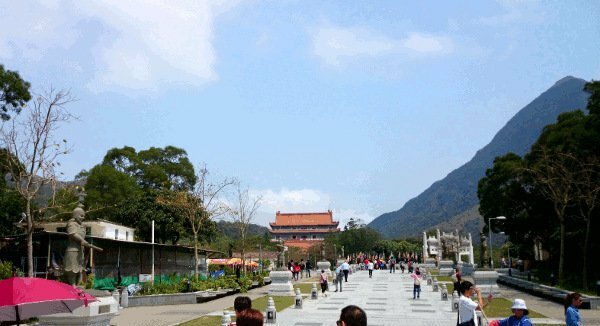 The base of Tian Tan Buddha is circular with a large walkway for visitors to amble. Every step we took, we were greeted with really beautiful scenery. Tip: Take some time to slowly enjoy the breathtaking view. It is truly awesome! After this spiritually lifting experience, we proceeded to have lunch at the famous Po Lin Monastery Vegetarian Restaurant. We had done some research before we traveled to Hong Kong, and many reviews said the lunch is really good. We will be posting about this soon. So do come back to visit and read about it, or subscribe our newsletter to receive updates. If you have ANY questions about What To See in Hong Kong – Big Buddha in Hong Kong Lantau Island, ANY at all, please submit your questions as comments below. I will be happy to help you out. This page showcases what are the Things To Do In Hong Kong. Some are fun. Some are cool. Some are amazing. Each appeals to different people in different ways. One thing’s for sure – there is something for everyone in Hong Kong. 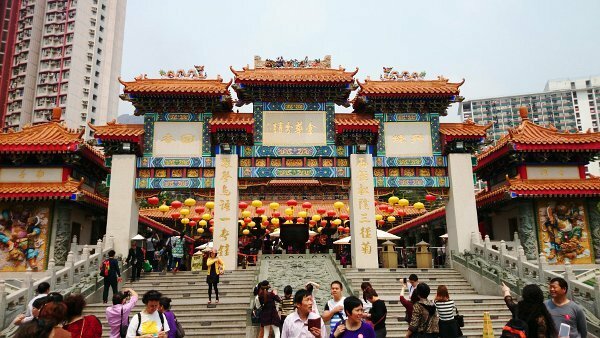 Renowned for its rich history as well as the rumors of granting wishes, Sik Sik Yuen Wong Tai Sin Temple must be on your travel itinerary when you visit Hong Kong. How do you make a wish correctly? The legendary Wind and Cloud. The funny Old Master Q. 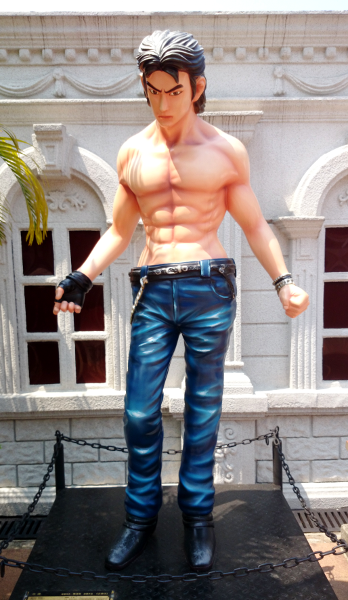 The enigmatic K. Plus many more Asian comic heroes and superstars come alive in full size statues along this avenue. A tribute that is worthy of your time and visit. 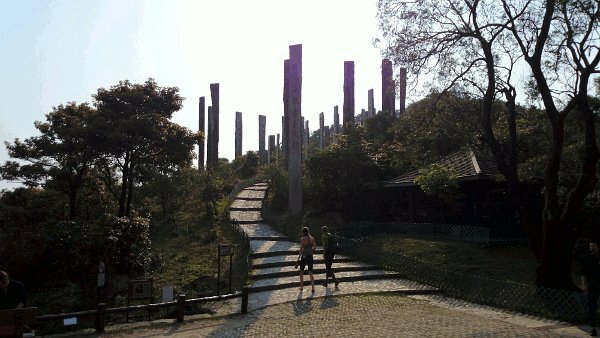 A little off the beaten track, within distance from Tian Tan Buddha, is a footpath that leads to the Wisdom Path. What is the Wisdom Path? 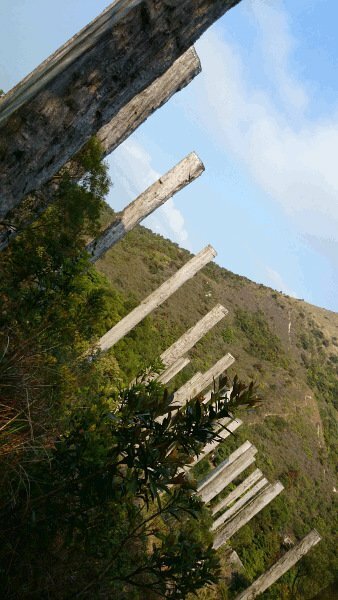 What are these tall wooden steles? And how tall are they? What are the words inscribed on these wooden steles? 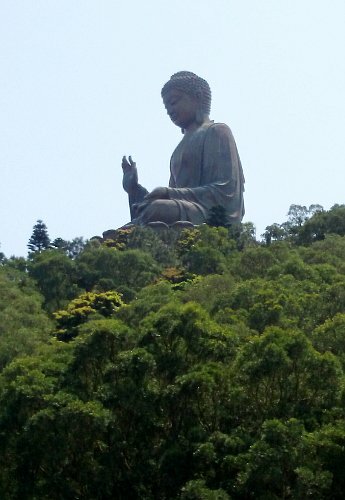 A visit to Hong Kong is not complete with a tour to Lantau Island, and to see The Big Buddha. Also known as Tian Tan Buddha. There is so much more than just this huge tribute to Buddha. If you have ANY questions about Things To Do In Hong Kong or any articles about Hong Kong, ANY at all, please submit your questions as comments below. I will be happy to help you out.